This morning I headed to the south end of Ft Myers Beach to a location known as Carlos Pointe. The site is part of a protected stretch of beach reserved for breeding Least Terns, Wilson's Plovers, Snowy Plovers and Black Skimmers. Currently the skimmers are active nesting here with several young birds present. However I came here looking for Whimbrels or avocets. We don't see many of these birds here, but they have been reported recently. Luckily for me a trio of Whimbrels were present, keeping company with several Marbled Godwits. The other day I drove out to the Everglades Ag. Fields in western Palm Beach County to check-out the sod farms and flooded cane fields for migrating swallows, terns and shorebirds. It was kind of a disappointing trip. Only found a couple of flooded fields, were most of the bird activity was beyond the scope of my bins, I really need to acquire a spotting scope someday. I could find all of the expected waders including wood storks and roseate spoonbills and a few shorebirds including Spotted sandpipers, greater and lesser yellowlegs, killdeers, a great many black-necked stilts, a possible solitary sandpiper and a dozen Long-billed Dowitchers. Dipped on any whistling ducks or early upland sandpipers. As for terns, I did see a sampling of expected species including - Black, Gull-billed, Least, Forster's and Caspian Terns. Along the Miami Canal, a great many Swallows were congregating. Mostly Barns Swallows with a few Cliff and Bank Swallows mixed in. Today I had a small window of opportunity to do some birding. I chose to follow-up on a posting by Dave McQuade about American Avocets on Ft Myers Beach. As I have dipped on the species so far this year it was logical to see if the avocets had stuck around. Well, I didn't really expect to have had them stick around and I was right. That is as far as their not being on site from 9 am to 10 am. Did find a few good birds though such as a quartet of feeding Red Knots. Bob Pelkey, of swfloridabirder.blogspot.com, invited me to join him on a trip up to Payne's Prairie State Park's LaChua Trail. Its a four hour drive and Bob likes to arrive early, so we left Ft Myers very early at about 3:30 am. Our goal was to find Mississippi Kites and for me getting that tick would nail down all four kite species that are found in Florida for this year. I was lucky to have see a White-tailed Kite in Everglades National Park back in early January. Snail Kites are easily found locally, year round. And the Swallow-tailed Kite is a popular sight here from late February till the end of July. So this just leaves finding a Mississippi Kite which should be found around Gainesville and the Payne's Prairie Park this time of year. This was a repeat visit for us as we had successfully found the kites here last year. So today we arrived as the park opened at 8 am, and started the day by birding the parking lot. Here White-eyed Vireos and Carolina Wrens dominate. Pushing-on we began hearing numerous Eastern Towhees and spotted four Indigo Buntings darting into the brush. A male Blue Grosbeak was singing atop a shrub near the La Chua Sink boardwalk and was briefly joined by a female Orchard Oriole. Water levels were highest I have ever seen here. Right up to both sides of the Trail. The flooded fields were rich with Pink Lotus, Water Lilies, Purple Hyacinths and Arrowroot. Along the trail Green Herons were very common and we were able to add a lone Least Bittern, a Purple Gallinule, several Common Gallinules, a couple of Black-crowned Night-herons, dozens of Black-bellied Whistling Ducks, a lone Mottled Duck and a young King Rail. But what about the Kites. They, like the vultures, usually don't take to air till around 9:30 as the air warms up.. So right on cue a pair of Mississippi Kites made their appearance near the Sink as they hunted for dragonflies. With the high humidity and rising temperatures it was time to move on. But was a successfully visit. On the trip home we elected to make one more stop, at Power Line, which actually divides Pasco County from Hernando County. It was also a place were Swallow-tailed Kites and few Mississippi Kite would congregate before migration. 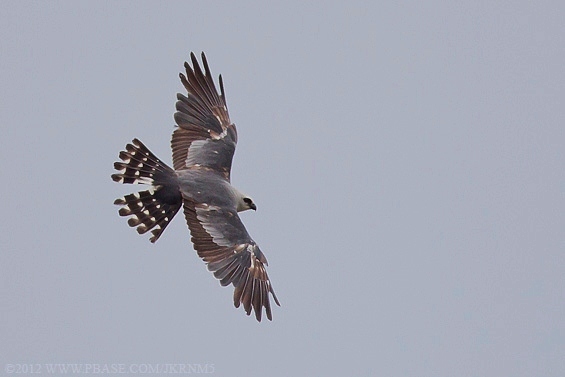 This year the Mississippi Kites haven't been seen here very often and today we didn't locate any and only saw on Swallow-tailed Kite. Other sighting did includes a pair of Southeastern American Kestrels, a Red-headed Woodpecker and a beautiful Red-tail Hawk. So from here we headed back to Ft Myers. Black-bellied Whistling-Duck, Muscovy Duck, Mottled Duck, Northern Bobwhite, Pied-billed Grebe, Anhinga, Least Bittern, Great Blue Heron, Great Egret, Snowy Egret, Little Blue Heron, Tricolored Heron, Cattle Egret, Green Heron, Black-crowned Night-Heron, White Ibis, Glossy Ibis, Black Vulture, Turkey Vulture, Osprey, Swallow-tailed Kite, Mississippi Kite, Red-shouldered Hawk, Red-tailed Hawk, Laughing Gull, King/Aztec Rail, Purple Gallinule, Common Gallinule, Sandhill Crane, Rock Pigeon, Mourning Dove, Chimney Swift, Red-headed Woodpecker, Red-bellied Woodpecker, Pileated Woodpecker, American Kestrel, Great Crested Flycatcher, White-eyed Vireo, Blue Jay, American Crow, Fish Crow, Barn Swallow, Carolina Wren, Eastern Towhee, Northern Cardinal, Blue Grosbeak, Indigo Bunting, Red-winged Blackbird, Eastern Meadowlark, Boat-tailed Grackle and Orchard Oriole.